Critics, at least those in the U.S., have at times complained about the dearth of movies that focus on the life of ordinary, often blue collar, workers. It’s not that it never happens. We’ve had our On the Waterfronts and Blue Collars. But still, it feels that the lunchbox is more than a bit bare. Great Britain has fared better, especially since the emergence of the angry young man stories and kitchen sink dramas in the 1950’s and ‘60’s. British director Ken Loach has even made it his focus to create films about those on the lower rungs of society, especially their struggles to get by. He might even be called the cinematic poet of the working class. 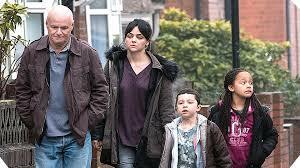 His latest film, I, Daniel Blake, is rather typical of Loach. It revolves around a laborer who is in as binding a Catch 22 as there can be. His doctor says he can’t work due to a bad heart. In order to get benefits, he has to receive a call from a government agency for a follow up. For some reason (a bureaucratic snafu of some sort) he has yet to receive the call. So in the meantime, to hold on to what benefits he can, he has to look for work (and prove it), even if he couldn’t take the job if offered. Meanwhile, he begins to spend time helping a young woman and her two children who have recently moved to the area. They haven’t got their benefits yet because she was late to her agency appointment because she was new to the area and had a difficult time finding where she needed to go. I think the irony here is that even though Blake has a bad heart, it’s bigger and operates better than the soulless bureaucrats who are supposed to be helping their clients, but tend to act more like people who want to make things so difficult for them they simply give up and go away. The screenplay is by Loach and Paul Laverty (they’ve worked together on many of Loach’s latest films including The Angel’s Kiss, Sweet Sixteen and The Hand That Shakes the Barley) and they’ve produced a very moving story between them. At the same time, it’s the kind of movie that is very good at dramatizing a problem, but not as good at providing solutions. Well, that’s not quite true. The two do offer two possibilities. At one point, Loach’s hero roars out that the problem is that there aren’t enough jobs. Very true and fair enough. But he doesn’t really come up with a way to create more. And it’s not even the problem for Blake; no matter how many jobs there are, he can’t take one. His other solution is a very Dickensian one: we all just need to be nicer and more empathetic with each other. Again, very true and fair enough, but not a particularly practical one. So in the end, I, Daniel Blake is frustrating, yet compelling. The conflicts may be familiar, but they still hold interest. 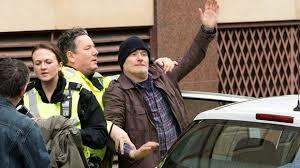 And the whole thing is carried on the shoulders of Dave Johns, normally a standup and improv comedian, powerful in a change of pace role as Blake. I, Daniel Blake is not only Dickensian in its sentiment. It’s very Dickensian almost all the way through, from the Kafkaesque quandary Blake finds himself in (Dickens was always more Kafkaesque than Kafka) to the dramatization of the poor and downtrodden (though Dickens could be a bit harsher on the have nots). But though most of the film may feel like it came from the pen of boz, the ending is pure Thomas Hardy. Dickens always had hope. But the cards in I, Daniel Blake are just too stacked against the characters. With Haley Squires as the young woman Blake tries to help. If Loach is the cinematic poet of the working class, the new movie Paterson, from writer/director Jim Jarmusch, is about a working class poet. 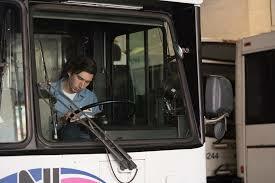 Paterson, the title character, drives a bus in Paterson, New Jersey (that isn’t the only bit of double play here-the whole town seems to have more than its fair share of twins per capita). When he’s not driving, he’s having a single beer at the same bar every night while walking a dog that has more personality than many actors; patiently and with good humor, tolerating his wife’s artistic eccentricities; and quietly observing the world around him. This last leads to what probably defines Paterson more than anything. Every night and every day, and with as much secrecy as Emily Dickinson, he fills a small notebook with poems. All in all, Paterson the movie has a certain winsome charm. Paterson, the character, really does very little and what little he does, he tends to do it the same way every day. He’s about a passive a hero as one can get in fiction. The whole thing feels like an extra lengthy shaggy dog story. And for all its passivity and repetition, it slowly wins you over with some amazing grace. In many ways, it really does little more than make you feel good. At the same time, that’s not exactly anything to sneeze at. And though I did like it, I wanted to like it more. Maybe it went on just a little too long and came a bit too close to wearing out its welcome. Or maybe it’s the somewhat condescending portrait of Patterson’s wife who is trying to be creative in her own way, but comes across through Jarmusch’s eyes as one of those silly 1950’s sitcom wives. Still there is something infectious about it all. 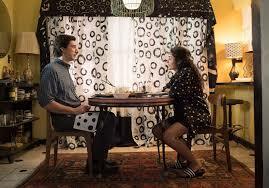 With Adam Driver as Paterson and Golshifteh Farahani as his wife. And finally we have a film about a poet of the working class, Neruda, which chronicles a time in Nobel Prize winner Pablo Neruda’s life when he is trying to flee his home country of Chile to safety in Argentina before his self-destructive habits and/or a keystone kop of a police detective stops him. The film is from writer/director Pablo Larrain (who also directs the upcoming pic Jackie with Natalie Portman and has also made a name for himself with such films as Tony Manero, No and The Club) and writer Guillermo Calderon (who also worked on The Club). The movie is about important subject matter and was well received, but I never could really get into it. 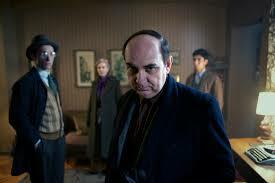 It’s divided into two through lines, one following Neruda and one following the detective’s attempts to stop him. Everyone gives it everything they’ve got, but I never found any of the characters interesting. With Luis Gnecco as Neruda and Gael Garcia Bernal as the police detective. Chile’s entry in the Foreign Language Film category.